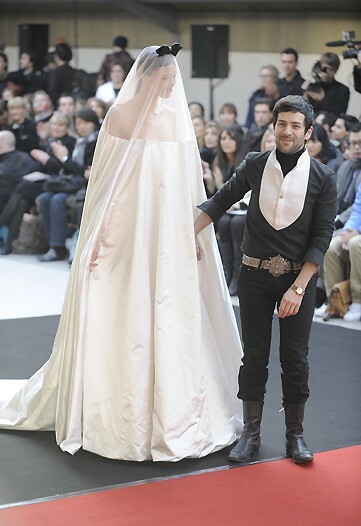 Alexis Mabille is a rising star who has shown some lovely pieces over the past few seasons. Through them, he has sown (or in this case, sewn) seeds of ideas within each of his collections that will one day bloom into greatness. Whether it’s with vines of silk flowers wrapping around your calf or a trail of bows slung softly across your back, his clothes can make a woman feel feminine. He has also shown us he can cut tailored pieces – while he may not be a master as yet, there is definitely a respect for the craft of cutting in his clothes. This duality of soft versus edge was highly evident in the designer’s Spring 2010 Couture collection, which in some cases was literally split down the middle. It’s hard to refer to a suit as boring when it’s half hot pink, no? The vertical split could add a dramatic twist to drab day dressing. Perfect for us Geminis, who always have a personality to spare in our bag of tricks. A classic colour combination - but is it couture-worthy? Mabille loves his red and it showed up in broad strokes, along with electric blue (a continuing story this season), vivid yellow, the hot pink and not-so-boring neutrals like this taupe-y silver. I could see Carla Bruni in this little number, although with a slightly longer skirt for the First Lady of France, svp! A whisper of a sleeve speaks for itself. Look at the bottle outline created by the shape of that dress – Mabille’s subtle about the sexiness of his clothes. There’s an allure, a curiosity he creates. I’ve always loved the intense sensuality of covered up clothing. Pop tarts of today – take note! This evening ensemble echoes the grace of ladies of the Victorian era, yet there is something very Audrey Hepburn and June Cleaver about it at the same time. And those crystal accents? Very 1980s Lacroix, n’est-ce pas? The masti is in the mix! While the clothes are beautiful and show promise, I do question whether they are worthy of being called couture. They cannot possibly touch the glory days of the old masters. A simple bride with the designer at her side. Mabille remembers them, too, I am sure – he ended his collection with the traditional bride – the finale in many couture shows past. Let’s hope he can be one of the designers to keep the couture tradition alive for a long time to come. Images courtesy of style.com and WWD.